Incumbent is to provide a single point of contact that can effectively address the requirements of ICASS GSO customers and service providers. Serves as the point of contact for services relating to the GSO Section and for guidance on procedures, complaints or implementing suggestions for improvements. 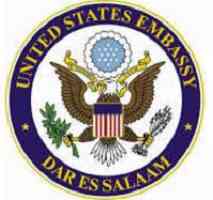 Coordinates on all visits of official visitors to the American Embassy in Dar es Salaam. Reports directly to the Supervisory General Services Officer. Incumbent provides administrative support to Embassy Program Sections by covering routine absences due to Rest & Recuperation (R&R), annual leave, sick leave, training, etc. of assigned Office Management Specialists and other Administrative Assistants. Assists with special projects and VIP visits, as required by Program Section activities. Manages the flow of correspondence, files, and other information and orders supplies and equipment. Position is supervised by the Management Officer. Under the direct supervision of the Information Program Officer (IPO), incumbent safeguards and protects U.S. Government classified pouches while in transit.